I happened across a NOAA internal training manual a couple of weeks ago that contained a photo of a USHCN official climate station that I thought I’d never get a photo of. The Baltimore Customs House. What is interesting about this station, is that it is a rooftop station, like we’ve seen in San Francisco, Eureka, and many other US cities. Rooftop stations are suspected to impart a warm bias to the surface temperature records, for obvious reasons. The NWS/NOAA has been reluctant to change these stations to ground-level, wanting to keep a continuous record. 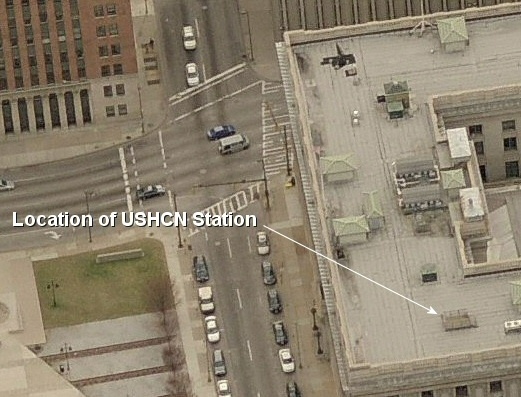 The Baltimore USHCN station closed in 1999 and has not been replaced at this location. 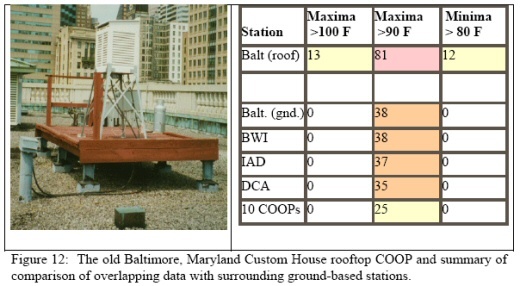 But, this NOAA internal training manual not only cited this example photographically, they also did a correlation study that proved that the rooftop placement was actually warmer. Instrument exposure standards are really compromised with rooftop locations (figure 11). 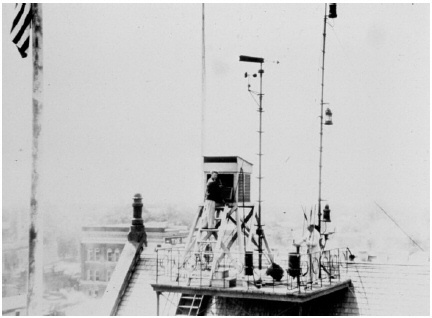 Figure 11: An Early Rooftop Meteorological Station. While the number of NOAA rooftop climate stations has remained at about 40 for the last decade, the number of private rooftop stations has grown during that period into the thousands. Rooftop exposures have an advantage of increased instrument security and good exposure for wind sensors (standard height is about 33 feet). However, there are also drawbacks. Access for maintenance can be difficult and exposure for precipitation and temperature instrumentation is clearly non-compliant, being elevated to high above the ground. Additionally the instrument exposure is usually over environmentally nonrepresentative surfaces (metal, black tar, shingle, stone etc. ), while at the same time being close to a wide variety of roof surfaces which are subject to change. No argument there. The trade off is security versus representivity of climate. But climate usually loses in a rooftop station instance. Rooftops make good observation sites if you live work, play, or grow your food on a roof. Unfortunately, few people do any of the above. Rooftop exposures have been shown to exhibit biases towards warm temperatures (both maximum and minimum) and lower precipitation when compared to ground based stations. The warm temperature biases likely result from extreme daytime heating of artificial rooftop surfaces, reduced cooling of the roof at night, and from heat flow from within the building, especially in winter. The biases can be substantial. One limited study indicates 5 to 10 degrees on summer days with bright sun and light winds. Biases have been found to vary significantly, depending on many factors (location on the roof, color of roof, type of roof surface (rock, metal, etc.) time of year, etc when compared to standard ground-based sensors. On the flip side, if a station has been on a non-changing roof for decades, the site may have good continuity (value) for tracking climate change and variability. For some climate applications, consistency with a long record can be more important than accuracy with a shorter record. The best of both worlds is to have an exposure compliant, long-term station. The table to its right summarizes a comparison of 12 months of overlapping data that was collected on the rooftop and at the new relocated site (for data continuity), relocated several blocks away at ground level with other nearby standard, ground based stations. A combination of the rooftop and downtown urban siting explain the regular occurrence of extremely warm temperatures. Compared to nearby ground-level instruments and nearby airports and surrounding COOPs, it is clear that a strong warm bias exists, partially because of the rooftop location. Maximum and minimum temperatures are elevated, especially in the summer. 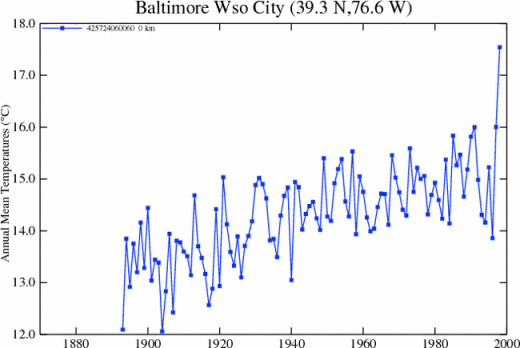 The number of 80 plus minimum temperatures during the one-year of data overlap was 13 on the roof and zero at three surrounding LCD airports, the close by ground-based inner Baltimore harbor site, and all 10 COOPs in the same NCDC climate zone. Eighty-degree minimum are luckily, an extremely rare occurrence in the mid-Atlantic region at standard ground-based stations, urban or otherwise. Temperatures can be elevated on roofs due to the higher solar radiation absorption and re-radiation associated with many roof surfaces including black tar, shingles, stone, and metal. During the colder months, ongoing upward heat transfer through the roof from the heated interior of the building also can contribute to the warm bias although stronger winter winds tend to create better mixing and minimize this impact. The table shows that the rooftop station has Tmax >90°F more than twice as often as other stations and a Tmax >100°F 13 times where no nearby station achieved it. Similarly we have this station recording a Tmin >80°F where no other stations did. Yet amazingly, knowing all this, stations like this, and stations that have instrumental biases such as Tucson, with its parking lot placement (USHCN) and HO83 problems(GISS) still remain as part of the USHCN and GISS datasets. The official all-time high temperature record of Tucson of 117°F still stands, set by a known faulty HO83 thermometer. In the case of Baltimore, the question is, in the plot below what really has been measured? Is it city growth, building energy use/dissipation, rooftop albedo variations, nearby building changes, or climate change? Given that it is impossible to disentangle all these things, the data, in my opinion, should be deemed compromised and discarded. In any other line of scientific study or in engineering, data that has been so badly compromised would likely be forced out by peer review, or the researchers themselves once the errors were discovered. Yet here we are today, keeping this station record for use in climatological study. This entry was written by Anthony Watts, posted on Jan 23, 2008 at 11:14 PM, filed under General. Bookmark the permalink. Follow any comments here with the RSS feed for this post. Both comments and trackbacks are currently closed. Maybe the lack of quality data is why the series ends in 1999. Actually, I think the last yearly data on that plot is 1998. I suspect 1999 was not plotted due to having only 5 months of data, not enough for an annual average. The photo of the platform and Stevenson Screen may be from when they started dismantling the station, as it appears the sides/railings have been removed. Anthony’s essay implies that the early record was too hot, artificially so. Then you say that the homogeneity adjustment has done a reasonable job. Has it? Seems to me it has added about 1.6 deg C to the early years and made the problem much worse. Even year 1940 (to take one at random) has been homogenised one degree hotter. Even for 1970 data a half a degree was being added to homegenise temperatures already too hot. Why? I simply cannot trust any homogenised data any more, absent a detailed description of logic and magnitude calculations. To the extent that whole databases suffer from similar problems, I have little remaining confidence in any reconstructions using past ground temp measurement, especially when ground is on top of a multi-level building. When is there going to be a culling of stupid stations, so that the record remains for permanent reminders of silliness, but the data are never used in a scientific way? Please keep hammering UHI. It remains one of the biggest weaknesses in the whole climate scheme. Geoff, reasonable in so far as any spurious warming trend has likely been eliminated. I am not totally up to speed on this issue, but are the above temps “corrected?” I just wonder because the two stations are for cities on Lake Champlain, accross the lake from each other. They used to be in synch, now Burlington is climbing while Plattsburgh has stayed steady. I have just noticed that on the weather report, the Plattsburg temp, which usually matches my car thermometer, I am on the Burlington side of the lake but rural, is almost always lower than the Burlington temp. Anthony, nice and very thorough write-up. In comparing the first and third photograph, one should immediately notice that the station in its later years was surrounded by much taller buildings than it was early-on. On top of the rooftop location (pun intended), this represents a pretty dramatic – yet gradual – change in surroundings. They say they are reluctant to change positions. Why not set up a second device on the roof, run it long enough for a good comparison, move it, then keep running both for comparison. Then only after the effect of the move has accurately been measured, then close the original. Anthony is one of many who has demonstrated problems in our present system. The experts have long known about these problems and have taken to herculean feats of statistical analysis to cope with these known problems. Steve, is one of the few who has dared to look at the resulting mess. Bravo to both of you. But the experts, who already knew of all this, should have long ago sat down and proposed a new, complete, world wide measuring system designed to eliminate the problems, and implemented in a way so as to be able to be continous with the old mess. Until they do, they are stuck with the mess that is the old hodgepodge of measuring stations that were designed and positioned for very different purposes, and which have undergone many changes over the years. With proper forethought, such a comprehensive measuring system could radically advance our understanding of weather. one should immediately notice that the station in its later years was surrounded by much taller buildings than it was early-on. YES! remember to check for shadow induced cooling bias! On top of the rooftop location (pun intended), this represents a pretty dramatic – yet gradual – change in surroundings. something that wouldn t have happened, if the station was based on the ground? The experts have long known about these problems and have taken to herculean feats of statistical analysis to cope with these known problems. Steve, is one of the few who has dared to look at the resulting mess. there has been a lot of silence since John V took a look at good vs bad stations. disrupted regularly by a picture of a bad station, of course…..
Something that should be identified and understood, regardless of the direction of the bias. #6 – I don’t know much about the history of the Plattsburgh station, but I found a paper on the Burlington station history that I posted on surfacestations.org that detailed the history. The Burlington station has moved repeatedly over the past, starting at the bottom of the hill near the lake, then halfway up the hill, then at the top, then further inland to its present location at the airport. At various times it has been located on rooftops, on the ground next to buildings, or out in the open. It is hard to say at this point how the location and instrument changes have affected that station’s record. I thought the rule was that measurements were to be taken at 5 feet above ground. Didn’t know temps were taken above buildings. Simply because SteveMc hasn’t posted a thread since Oct 4th, ’07, doesn’t mean nothing has been happening. Have you been to surfacestations lately? Have you seen the quality map and pie charts showing increased distribution of station surveys? JohnV did his initial run on 17 rural CRN12 stations. More have been added since then. Ask JohnV if he’s run another series since then. As far as the “disruption of a bad station picture”, look at surfacestation’s pie chart. 482 stations surveyed, with 13% falling in the CRN12 rating (the “good” stations from which JohnV got his rural series), and 87% having a CRN345 (the “bad” stations). It’s not that anyone is cherry-picking the bad stations to show, it’s just that, statistically speaking, there are fewer “good” stations to show. And since we’re talking about silence, what has the user of this data (GISS) said since the surveys began? The surveys question their claim of a “high quality” measurement system. Alan, I don’t think we can assume that a “reasonable” job has been done. What you can tell by looking at the graph is that some adjustment has been made. Is it the correct adjustment? are the sites within 1000KM actually Rural sites? additional error generated by this adjustment process? There is an easy way to deal with this problem. Delete the bad sites from the calculations. There are roughly 200 really bad sites in the US, out of 1200 sites. Just delete these sites. be vastly more dense than anywhere else in the world. less than a handful of stations. Fewer better stations is better than more worse stations. Just delete the bad sites. The sensor network was never designed to collect sensitive climate data. It’s purpose was to provide the numbers that are fed into weather forecasting models so that the 3, 5, and 7 day forecasts can be made. As such, it’s always been enough that the new location was better than the old. Doing detailed studies of how new locations differ from the old wasn’t in the mandate, nor was their ever money provided for such studies. Heck, Anthony has documented that many location changes were actually worse, it’s just that new equipment required it (short cables) or that it was more convenient for somebody. The idea that we can use this network to puzzle out climate changes over the last century, to an accuracy of a few tenths of a degree is utterly laughable. sod, your getting even more desperate than usual. Are any of the new buildings close enough and tall enough to cast much of a shadow? Not to mention in the right directions? Irrelevant. Changes are not supposed to be happening in the environment at all. sod, as usual you try to distract through irelevancy. John’s study was purely on the affect of micro-site changes. Nor was it concluded that his conclusions were definitive. In addition, it’s been shown that many of the stations are misclassified. Just because a station was in a rural setting a number of decades ago, is not proof that the arrea is still rural. Additionally, a station can be in a region that is generally rural, but still be surrounded by enough buildings and asphalt to seriously contaminate the record. As JohnV himself noted, he made no attempt to verify whether the stations listed as rural, were truely rural. don’t mess around trying to adjust them. Just delete them. The site coverage in the US will STILL be vastly more dense than anywhere else in the world. This would seem a pretty easy experiment to run. Anthony? Steve? Some postdoc/jr faculty in need of a pub credit? Any takers? It would be very interesting to see the results. I agree this is exactly what is needed. But, I’m only at 40% of the total number of USHCN stations surveyed. And we have large gaps in the Midwest still. What we really want to find are the BEST stations, because those will be the most representative of the regional climate record. We really need stations in Kansas, Arkansas, Nebraska, Missouri, Idaho, and the Dakotas and Montana. I respect that you have doubts about the issue. In your own blog you routinely cast doubts on pronouncements of our government. Government through history has always had its secrets, it’s agenda, and its corruptions, so I undertsand where you hail from on the issue. Given that, why then would you accept, without any doubt, data provided by a different arm of the government? The mission of this website, and the mission of my own work is to determine if the data and conclusions presented by NOAA, GISS, NCDC and other agencies of government are in fact accurate and error free. 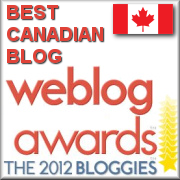 Given your apparently concordant world view of US Government information on your own blog, what’s not to like? If sunshine and shadow produce bias, then you are back to tree rings. Changes in cloud cover could be changing temp measurements and so even the instrument is not measuring exactly what is claimed, but multiple inputs sunshine and ambient temp, for starters, that will never be untangled. Is that what sod is saying? before i answer your question let me explain my position on your work and ask a real question of my own. i like your slideshow presentation. unfortunetly i think it is about the opposite of your regular posts here or on surfacestations. the slide show is not alarmist. the first part about the colors shows that you are capable of doing real significant scientific work. it gives some sort of balance showing shading issues as well. on the other hand, when i read your regular comments here or on your site, i always feel that you are just providing the confirmation of the week. “something is wrong” to the skeptic crowd. the site would be nice, if it was a real investigation into the status of the stations. but i think it s abused to provide a sense of insecurity in the temperature data, without having done any real work on this part of the subject. 1. show that the different types produce a different trend. John V demonstrated that this is not the case so far. 2. show in case studies, how the history of a type 5 station changes the local trend. i haven t seen any real work on this. people leave your site with the impression, that current measured temperature is worthless. that 50% of 20th century warming is UHI. that the Loehle proxies are more accurate than modern station data. they wouldn t get that impression, if the tone on your site was closer to that in the presentation. what does “error >= 5°C” mean? respect that you have doubts about the issue. In your own blog you routinely cast doubts on pronouncements of our government. Government through history has always had its secrets, it’s agenda, and its corruptions, so I undertsand where you hail from on the issue. i think the difference is huge. the US government messed up in Iraq and are now involved in a cover up. that is pretty straight forward. such a simple causality and explanation can not be constructed for the surface stations conspiracy. sorry. Is that what sod is saying? actually i was making fun. but yes, i believe that shading issues are balancing some part of other effects. i haven t seen any picture of n irrigation influenced station so far. are there any? John V showed (with very limited data though) that even the bad stations were in good correlation with all stations. ps: yes, i would prefer better stations too. but we are stuck for climate research with the stations from the past..
removing the class 5 sites LOWERS the warming trend. The question is, is the lowering significant? different question than the one I pose. that has been lost on everyone but me. I agree, but like I clarified in 5, I believe a reasonable job has been done in removing the spurious warming trend (and lets face it, its the provenance of the trend that is of most interest to readers here). I think the issue is about data quality. Noaa set a standard. Noaa should follow its standard. I have heard the following objections BEFORE THE DATA WAS IN. A. adjustments correct for non standard stations. B. Errors sum to zero. C. Trend is all we care about, so bad stations are ok.
D. The US is oversampled by a factor of 3 so dont worry. F. Surveys will be skewed to hicks who live in the sticks. G. The ice is melting. is that the warming trend after homogeniety adjustment, is LOWER than the trend before. 986km? why not 1200km? why not 500km? The question IS a technical one. B. “adjusting” it with untested methods. intelligent conclusion. You can draw a conclusion of course. Just not an intelligent one. spurious warming trend,” you believe that the various adjustments remove from the raw data all warming biases except for the warming trend due to climate change. I am amazed at that conclusion. Have you look at the termperature record and adjustments for New York City’s Central Park? How about the study showing that temperature recorded trernds are (after adjustments) highly correlated to economic development in the locality? It is the magnitude of error value assigned by NOAA for a site that meets the CRN5 criteria as listed on the Climate Reference Network handbook. That link to that has been in my Resources Page on my website for months. Class 5 (error ≥ 5ºC) – Temperature sensor located next to/above an artificial heating source, such a building, roof top, parking lot, or concrete surface. Under NOAA’s own criteria, our Baltimore station is a CRN5, and the errors that they suggest for CRN 5 (≥ 5ºC) are in line with the error values published for Baltimore’s roof station in the table of the NOAA PUC6 training manual. The scheme was originally developed by Michael Leroy of Meteo France and they use it to classify their own network. 3. Network has problems, missing data, MMTS created in mid 80’s to remedy observer issue, but creates cable length bias and places temp sensors closer to human influence. 4. NOAA/NWS start COOP budget cutbacks in early 90’s Less managers/techs. 5. Network starts falling into disrepair due to lack of supervision and quality control, at the same time urban growth overwhelms many stations placing them in center of UHI where they were rural before. 6. USHCN subset is created in early 90’s, held up as “high quality network”. 7. Data from USHCN sub-network is being used for climate study without due diligence on data quality control in mid to late 90’s, climate researchers are taking the “high quality network” description at face value without actually inspecting sites hands on. 8. Early 2000’s, NCDC recognizes COOP network is unsalvageable for climate study, creates new Climate Reference Network to replace it for data source of surface temperature record. Point 7 is what this discussion is about. I don’t see much difference between here and your example of “the government messed up” If they hadn’t, the new CRN network would not have been created. You and others want me to run this/analyse that. All well and good, and some like JohnV have taken it upon themselves to do so on incomplete data. All fine too as it promotes ideas. But I post here for feedback. The feedback I get is invaluable since I don’t have a group of scientific peers such as at a university to bounce ideas off of as the project progresses. I’m one person with an idea, zero budget, and volunteers. Sure it could be done better, but nobody has stepped up. When the project is nearing majority of completion, then I’ll look at broad scale temperature analysis, until then I’ll continue to post census information such as the distribution/completion rating charts. They provide a metric for progress and for motivation of the volunteers. When non-compliant situations are extreme, either correct the situation or consider closing the station down. Take digital photographs with each scheduled preventative maintenance visit per guidelines or as needed when change is apparent. And of course, don’t forget to coordinate issues with our climate community partners. They are ready and willing to assist with their climate expertise. It’s nice to see that NOAA thinks photographs are relevant enough to have done regularly. Problem is, they haven’t. Or if they have they aren’t sharing. Queries in this regard yield nothing, with pronouncements of ‘we aren’t doing photos’. But there are a handful they have on some WSO websites. In the meantime my project continues. Patience. I agree with you that the data is substandard. But it would appear that a reasonable job has been done polishing this turd. By that I mean that when analysis is done on any ‘global warming trend’ on data including this station, we can be sure that this substandard data won’t contribute to the trend. Would it be better just throw this data out? Undoubtedly. But its not just a quality issue, its an issue of what does the lack of quality do to the trend? In this case, sweet FA. The main reason I highlighted the homogenised data is that Anthony tends to exclude it when presenting his findings. Its annoying, because its an important part of the analysis. Leaving it out leaves an impression that data like this is contributing to a spurious global warming trend. I’m presenting “sites” in these posts, not regions. If I were doing regions, homogenised data would be more representative (and appropriate) of a region of 1000km as it encompasess other COOP station data influence within that radius. Question 1: If the “normal” “temperature of the Earth” is 14 C as an average, but right now it’s 6 C and feels like 3 C, why could I possibly care if the “normal” “temperature of the Earth” has gone up less than 1 C in 127 years? Today’s average daily high is 15 C, and the record is 30 C 35 years ago. Today’s average daily low is 5 C, and the record is -8 C 65 years ago. Today’s high and low are expected to be 5 C and 4 C.
Wow. Global cooling; it “should have been” on average 10C warmer and 1 C colder. At least where they’re measuring it at the airport. Question 2: Is it city growth, building energy use/dissipation, rooftop albedo variations, nearby building changes, or climate change? Question 3: Does the global mean temperature anomaly trend tell us if “The Earth” is “Warming” and “Cooling”? Answer 3: Some people would like to think so. Experiment for anyone interested and able. Just an idea. 1. Go out and buy 15 digital thermometers that send out a temperature reading every 10 minutes wirelessly, and an attachment for your computer that gets such transmissions and records them. 3. Check the reported temperatures against each other, and see what variation you get. Compare to similar airport reports of the temperature and lights equal zero sites in your area. 4. Combine the 6 readings into an hourly mean and compare for each of the 15. Compare to similar airport reports of the temperature and lights equal zero sites in your area. 5. Combine the 24 readings into a daily mean and compare for each of the 15. Compare to similar airport reports of the temperature and lights equal zero sites in your area. 6. Combine the 30 readings into a monthly mean and compare for each of the 15. Compare to similar airport reports of the temperature and lights equal zero sites in your area. 7. Start combining anomaly stats per day and month to the hourly means. Compare to similar airport reports of the temperature and lights equal zero sites in your area. 8. Start combining those into yearly stats. Compare to similar airport reports of the temperature and lights equal zero sites in your area. Keep doing this. What do you end up with? Some number telling you what it’s kinda like outside locally, of which probably none match. Good luck, new climatologist. Remember to never share any of your data. If there exists a sound basis for making adjustments to historical temperature data, the adjustments must be correct in physics and they can be done either on raw data (preferred in deg K) or on some form of arbitrary anomay basis derived from an arbitrary reference period, which itself might suffer from the same error of physics. The former method is scietifically better. My objections to your comment that the adjustments had done a reasonable job led me to ask why the adjustments had taken over-warm data and made it warmer. Surely, it should have made it cooler to compensate for the physical observation. As for the overall picture, I agree with Steve Mosher. A person like you or me, remote from the actual data, simply cannot eyeball a graph and pronounce it an improvement. I tried to back my criticism with logic and physics as explained by others, probably credibly. Can you tell me why 0.5 to 1.5 degrees of warmth was added to the early years of the records shown by Anthony? What physics dominate? This is really important, bucause until they get the numbers right at the GISS, HADCRU etc level, it is a waste of time writing elegant papers that reference these dubious sources. Trends have a place; they are easy to comprehend and project. But, they must be constructed on a trustworthy basis. Otherwise, stick to absolute. No known principle gives you 10/10 for making an irregular graph look smooth and level in this type of data. Yes, there is good reason to archive then scrap a lot of USA station data. Please don’t allow it to remain to infect good work. The purpose of the early Stevenson/Glashier screens was to create a shadow so the thermometer was out of direct sun. So can you make an automatic assumption that a larger shadow, from a building, falling on the screen would produce cooling? I think not. It is plausible to argue that surrounding a station with tall buildings would create a stagnant pool of hot air, in the same way as a car interior heats when the windows are up – through reduced circulation. Like a glasshouse. I’m just about done with hypothetical models. Return to measurement of actualities. “And of course, don’t forget to coordinate issues with our climate community partners.” What does that mean in English? Anthony surely knows a lot more about this than i do. shading issues are in the very good presentation that you can find on his site. but he decided not to mention them in this case here. in short, the air around the Stevenson screen will be much warmer, if the whole place is in sunlight. shadow will decrease the temperature. the meaning of a term error would be rather obvious. with the signs the other way round (error>=5°C), it is not. it could be some average error. a maximum error. daily, monthly, per year or over station lifetime..
Hunt Valley I agree with sod, it doesn’t seem like it would be a recurring error once the problem is fixed. Under NOAA’s own criteria, our Baltimore base is a CRN5, and the errors that they advance for CRN 5 (≥ 5ºC) are in band with the absurdity ethics appear for Baltimore’s roof base in the table of the NOAA PUC6 training manual.